I'm happy for Charles Mann and Georgia's basketball players. Mann won a pressure game for Georgia with his play. He did it at the free throw line with 2.5 seconds left in a tie game that Georgia came from a second half deficit. It was a team effort in the comeback win. That against Western Carolina, a team predicted to finish fourth in the Southern Conference. The Catamount's best win this season was over UNC-Ashville in the season opener. They also have losses to RPI#319 Wright State and RPI#222 Coastal Carolina. Now they have a loss to RPI#276 Georgia. While a win is a win in the minds of most Georgia basketball fans, that Georgia was down as much as ten points in the second half to a team that it should be handling, even on an off day, is terrifying to me. That isn't a confidence booster. That's just the state of Georgia basketball. I hope he's right, because it looks like three lopsided losses from where I'm sitting. D-II West Georgia took Bama to OT in an exhibition game. Maybe Fox should schedule them. I finally came to the conclusion after watching this pathetic schedule for a month that (and I can't believe I am saying this) WE NEED a PEARL! In order to recruit players you need two things. 1. Recruit your fanbase and 2. Play on TV. When your school plays a SoCo schedule then you are never on TV and you have given your fanbase a reason not to come. 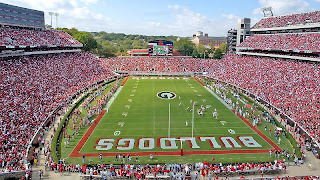 Why would a recruit want to come watch UGA / Wofford, App St, WCU, etc.....? This just keeps getting worse every year. I don't care if we lose every game in December if we are playing top 30 type teams. At least Felton brought in Gonzaga, Wisconsin, Illinois, etc... He just could not connect with fanbase or coach. Pearl recruited the fanbase first at Tennessee (rented buses for road games) and then scheduled big non conference opponents year after year. The players will not come to UGA until given a reason to. While it'll never happen, Pearl or someone like him is exactly what UGA basketball needs. Fox, by all accounts, is a very smart basketball guy. However, it doesn't seem he is great at connecting with the fans/supporters, it doesn't seem he's good at recruiting, and it doesn't seem he's great at communicating what he wants from his players to them. The home schedule doesn't help Fox because we don't have the big draws to help prop up the attendance numbers. It'll be an interesting season. We've gotten to this point in the season with me feeling exactly the same way the past two years, and I've ended up being surprised by our win total. However, if we play these last two OOCs and the conference the way we played against WCU, 12 wins is the upside. Fox scheduled very tough til this year and it didn't help him at all. He tried to schedule his way into the NIT to save himself. It's not working b/c of the disaster in charleston.